SYNOPSIS - Although the king's illegitimate son had promised he would never seek the throne, he breaks his oath and gets himself into so much trouble that his only hope lies in rescue by the greatest Paladin . . . who will be born in another 500 years. This is the story of Selamis, once Gird's Luap and his journey after Gird's death. The search for peace between peasants and mageborns is too high and fraught with dangers. As Luap struggles to find a balance, he awakens an ancient evil that was imprisoned for decades. 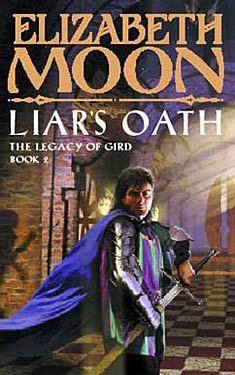 FL Speak - The second and concluding part of the series, Liar's Oath tells the story of Selamis, Gird's luap. We all know that Gird dies in the last book. It can be said that this book is essentially divided into three parts. First part deals with Gird before he dies. Yay for me, i like Gird more than the rest. The second part deals with life after Gird and the third part deals with the final separation of the mageborn and the peasants. Gird, after successfully defeating the mageborn lords, finds peace hard to come by. Instead of mageborn and peasants living peacefully, they have started to blame one another and more often than not, Gird has to pass judgement. During one of these confrontations, Gird is somehow able to take away all the evil feelings in their hearts and take it onto himself, momentarily cleansing the vicinity of dark thoughts. But at a high cost - his death. Before Gird's death, Selamis takes Gird to a place where he thought the mageborn can live in peace and try to use their powers for good intentions. Though Gird denied his request stating the need to stay together for peace, he apparently changes his mind just before his death. With Gird dead, the Marshalls rule the city. Selamis never became a Marshall, instead he wanted to take all the mageborn away so that they could live in peace. After Selamis leaves with the mageborn, the world seems to be at peace. Little did he know that his perfect world was coming crumbling down. The place where he takes his people was a old prison site for a very great evil. The elves and the gnomes warned Selamis about the danger in riddles, but Selamis chose to ignore them because he wanted to see his people live without fear. Slowly with time, the evil started to tamper with his decisions and choices without Selamis realizing it. He wanted to become his people's champion, he became their doom. What followed was mayhem. A future king and a future Paladin of Gird were the only ones who could save them now. But at what price?? You can't hate Selamis. He was the perfect luap to Gird, he was right about his decisions and choices. But in his eagerness to find peace, he made an error that he couldn't foresee. A good read and a good end to the duo-logy.